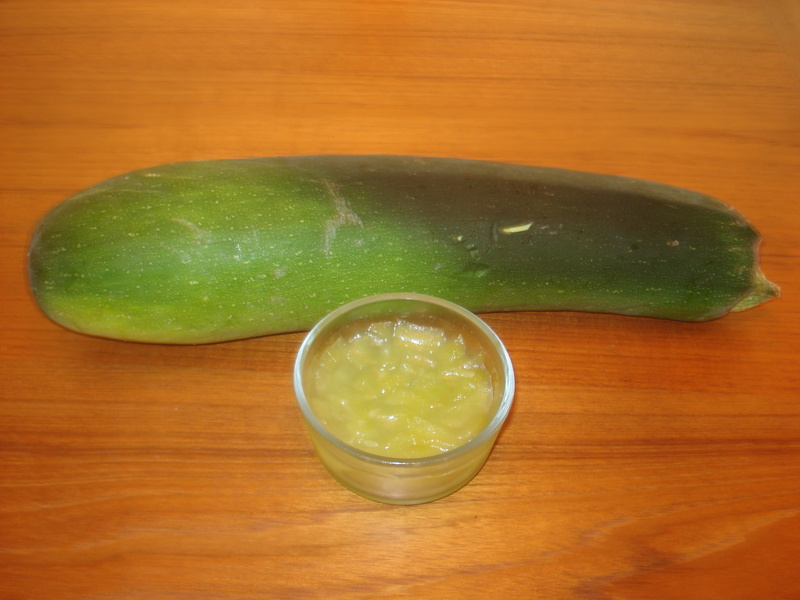 Zucchini squash is a vegetable that often produces quite a crop of ripe squash. As I was picking off the squash from a plant someone teased me if I was going to make it into jelly or jam, knowing that I seem to make everything into jelly. Before that I had no thought of making it into jelly, rather I was going to turn it into bread. However, a challenge is a challenge. I researched the recipe but found few recipes that suited me. Most recipes called for jello rather than pectin. So I decided to make jam utilizing pectin. I cut up the squash into small pieces. I cut up enough that I had 8 cups of squash. I put the pieces into my cooking pot along with enough water to cover the squash. I cooked the squash until the pieces turned a clear color. I then added a drop of green food coloring to the mixture. I then added 3 cups of sugar. After bringing it once again to a hard boil I added the pectin. I added a little bit of margarine to prevent the jelly from having foam. I then let it boil for a minute. I then let it cool somewhat I poured it into a freezer container. After it jelled, I froze it in my freezer. What an unusual jam. It has a pleasant texture and a pretty color. Everyone who has tasted it was surprised that it had a delicious flavor. Gallery | This entry was posted in Recipes and tagged Texas Jam, unusual jams, unusual jellies, vegetable jams, Zucchini, Zucchini Jam, Zucchini Jelly. Bookmark the permalink. What about using regular Sure Jell? Instead of freezing have you used a 10 minute water bath or paraffin wax for a seal? The pH of squash is highly variable I would not recommend canning squash jams without verifying with a pH meter. When I was a young man many moons ago I used paraffin wax for a seal but today they do not recommend it because of bacterial concerns. It had the texture of chunky applesauce with the taste of sweet cooked squash. It reminded me of the squash or pumpkin candies I have eaten. Definitely worth making if you have enough squash. Not only is it tasty it is relatively easy to make too. sounds like I would enjoy it. My daughter surprisingly like squash, but only when my Sister-in-law makes it. I will have to mention this one to her. Thanks for the response! This is wonderful!!! Thanks for sharing! !